The threat of militant extremism among Iran’s Sunnis is being taken very seriously in Tehran. Iranian authorities have been exerting considerable effort to stem the spread of Salafism and Wahhabism into Iran’s mainly Hanafi Sunni majority regions. One strategy that authorities are not pursuing, however, is development. Indeed, the continued underdevelopment of these regions is leaving the door open to radical Islam. Iran’s Sunnis have long struggled with poverty and discrimination, and are suspiciously viewed as the country’s fifth column. Iran’s Shiite-centric policies and its security-driven paranoia are contributing to the economic hardships of Iranian Sunnis, and fueling their sense of alienation. These discriminatory policies can be felt throughout Sunni-majority regions. In a remote, economically deprived village in Iran’s Sistan-Baluchistan province, “There are no men; all have been hanged by the government for drug and other offenses,” says Shahindokht Molaverdi, a vice president in President Hassan Rouhani’s government. Political and religious alienation and severe poverty are widespread in Sistan-Baluchistan, a province in southeastern Iran. With a population of 2.5 million, Sistan-Baluchistan is one of Iran's largest provinces and is comprised of a majority of Baluch Sunni population. Although there are ethnic and sectarian cleavages, the source of tension is largely due to religious differences. It is also one of the driest regions in Iran, with little rainfall and consistent drought. Its long 680 mile border with Pakistan and Afghanistan has become a route for smuggling and drug trafficking. The Iranian government has invested little in developing this outer region. The province is plagued by unemployment of over 50 percent, with many turning to crime, banditry, and smuggling to make an income. Like other Iranian border regions with majority Sunni Muslim populations, Sistan-Baluchistan is also a base for armed insurgent groups, among them Jundallah and Jaish al-Adl. Over the years, both groups have carried out a number of attacks against the Iranian military, Revolutionary Guards, and civilians. In 2010, Iran captured and executed the leader of Jundullah, Abdul-Malik Rigi and his brother, Abdul-Hamid Rigi. That didn’t halt the violence. In October 2013, 14 Iranian border guards were killed and 7 injured in the city of Saravan. The armed Baluchi insurgent group, Jaish al-Adl, claimed responsibility. It alleged the attacks were carried out in “defense of Baluchi youth and in protest of Iran’s interference in Syria.” In retaliation, 16 Baluchi prisoners were hanged by the authorities. Sunni Baluchi leaders, including Molavi AbdolHamid, a popular Sunni religious leader of Baluchistan, condemned the attack on the border guards and warned that violence is harming the interests of the Baluchi population. In February 2014, another 13 border guards were captured by Jaish al-Adl. They were later released due to mediation efforts by local Sunni leaders, but in April 2015, another eight Iranian border guards were killed in a clash with Sunni rebels. Typically, Iran has blamed the unrest in the province on foreign powers, particularly the United States and Saudi Arabia. By blaming terrorist acts on foreign-backed Wahhabi-Salafi groups, Shiite-centric hardliners are avoiding their own responsibility in the emergence and sustenance of such local extremist groups through their discriminatory policies. To monitor activities of Sunni groups and prevent Wahhabi-Salafi proselytization, the Iranian government established a council in 2008 to better control schools for religious teaching of Sunnis. 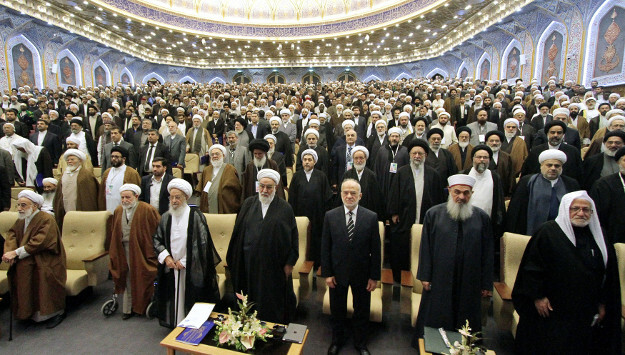 The bylaws of the council placed representatives of Iran’s supreme leader in charge of administrating Sunni schools. Sunni members of parliament described the bylaws, including its first article, as discriminatory government interference in Sunni religious affairs. Meanwhile, prominent Sunni clerics—including Abdolhamid—have expressed concern and disappointment over the arrangement. The Iranian government also closely monitors the situation in Kurdistan, another Sunni majority province in the country’s northeastern. Iran’s interior ministry recently published a report on the activities of alleged ISIS sympathizers in Kurdish areas. The report refers to the activities of Salafi groups in Iraqi Kurdistan and asserts that “considering ethnic and religious ties [between Iraqi and Iranian Kurdistan] these activities pose a potential threat to the internal security of Iran.” Kurdish Salafi groups include Ansar al-Islam, the Kurdistan Islamic Emirate, Kataib Qaed fi Kurdistan, and Jaish Sahabeh. Khamenei warned during a 2010 trip to Kurdistan about Wahhabi and Salafi activities there, and accused those who “harm the unity of Muslims, both Shiite and Sunnis” of being foreign agents. “They are using religion as a pretext to destroy national unity,” he said. An interior ministry report also stated that in all Iranian Kurdish regions, “unorganized activities” of the Salafi movement are visible, from the city of Urmia to Paveh. In an effort to intellectually uproot Wahhabism and Salafism, the Hawza ʻElmiyya in the city of Qom—a seminary where Shiite Muslim clerics are trained—has provided special education for thousands of people around the country. They aim to raise awareness and promote a critical approach to “Wahhabism, Baha’ism, Sufism, fake mysticism, Christianity, and Zoroastrian.” The latter two faiths are legal in Iran, but have been lumped in with the others in an effort to strengthen the footing of the dominant Shiite faith. The Iranian government’s excessive paranoia and harsh treatment toward Sunnis could prove counterproductive and provide further breeding ground for violent groups. The Islamic Republic might be more successful in its fight against extremist Sunni groups if it would try to win the hearts and minds of Sunnis and enhance, instead of constrict, their religious and ethnic freedom. Such opportunities to change Iran’s relationship with its Sunni minorities are available for the Iranian leadership. The impoverished Sistan-Baluchistan province is also home to Chabahar port, which India and Iran have recently pledged to develop at a cost of roughly $150 million. The project is geopolitically significant as it will give India land and sea access to Afghanistan and Central Asia, bypassing its rival Pakistan. It will also grant this neglected Iranian province a chance to escape its economic malaise with the creation of new jobs and investment in industry, reducing the allure of extremist ideology. The Rouhani government has also taken symbolic steps to address discrimination, including assigning a Sunni ambassador to Vietnam and appointing Sunnis to local and provincial positions. But more needs to be done, and a policy of inclusion and development for Iran’s Sunni minorities will go a long way to warding off the threat posed by radical groups. Alex Vatanka & Fatemeh Aman, "The making of an insurgency in Iran's Balochistan province," Janes Intelligence Review 6, No. 18 (2006): 22.